The Jewish Home fears that Liberman's plan to finish building separation fence would isolate Etzion Bloc. Israel's security cabinet toured the South Hebron Hills last week alongside Prime Minister Netanyahu, raising fears that plans are underway to finish the separation fence in southern Judea. The right-wing Jewish Home is opposing the move, fearing the the fence would isolate the Eztion Bloc and turn it over to Palestinian rule. "It's absolutely clear to everyone that a fence creates political facts on the ground," a source from the Jewish Home told Arutz Sheva. "We are convinced that the Likud will not hand over places like Tel Betar, where Bar Kokhba fell, to the Palestinians. We will do everything in our power to prevent this moves, as we have blocked the initiative of Defense Minister Lieberman to double the city of Qalqiliya." The source was referring to a now-shelved plan promoted by Defense Minister Avigdor Liberman (Yisrael Beitenu) to build 14,000 housing units for 50,000 Arab residents in the Arab city of Qalqiliya. 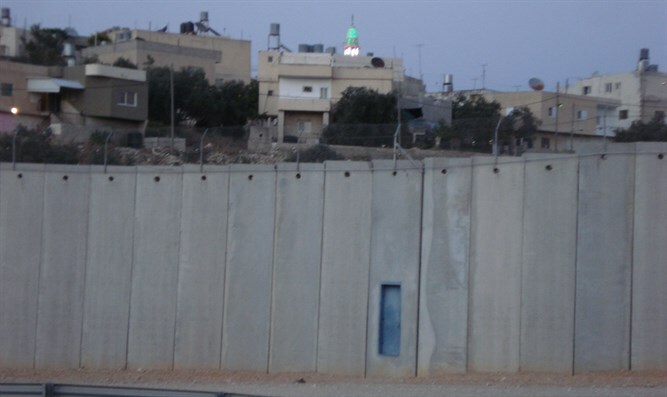 Israel commenced construction on the barrier in 2003, at the height of the second Intifada. Then-Prime Minister Ariel Sharon had hoped that the fence would stop the easy access Palestinian terrorists had to major Israeli population centers. While the number of attacks nosedived, the fence faces deep opposition among Judea and Samaria residents, who contend that the fence, which is built on the pre-1967 cease fire lines, unilaterally mark the border for a future Palestinian state. The fence has still not been built on the border between the South Hebron Hills and the Judean Desert, near Arad, and Liberman has vowed to change that, contending that the thousands of illegal Palestinian workers who flood into Israel from the Arab village of Yatta pose a security threat. The work was halted in the past following protests by both Jewish and Arab residents of Judea and Samaria, as well as petitions against the fence submitted to the Supreme Court. The petitioners accuse the government of expropriating land and causing damage to the environment as well as to local Jewish-Arab relations.